This powerful self hypnosis MP3 will give you the power you need to finally overcome panic attacks!!! Enjoy freedom from panic attacks with this self-hypnosis mp3 by Steve G. Jones! Hypnosis can get at the root of what is causing the panic attacks that can be so crippling to your social life and well being. A panic attack can feel like a heart attack with numbness in the arm and lips or it can affect your breathing to the point you fear you will suffocate. Some people break out in an uncontrollable sweat and feel that they will literally die. By looking beyond the situation to the real cause of panic attacks, my Panic Attacks Hypnosis MP3 frees you from these unexplained and often irrational reactions. The National Institute of Mental Health defines a panic attack as an unexpected and reoccurring feeling of intense fear. It is extremely frightening to the person going through the attack and is also believed to lead to depression or substance abuse when the person under the attack feels no way out. Hypnosis is the way out and an effective way of helping the sufferer relax. Cognitive restructuring and relaxation are two of the top recommended treatments for panic attacks. Hypnosis is able to accomplish both simultaneously. The beginning therapy relaxes the body and mind to a state similar to that which happens just before you drift off to sleep. When relaxation is achieved, then the cognitive changes can be implemented. To take that which is irrational and replace it with logical thinking in a panicked situation is the role of hypnosis. LEARN HOW TO COMBAT PANIC ATTACKS WITH HYPNOSIS!!! Although things seem very difficult right now, it can be easier than you think to see a new you and feel great about it! Steve G. Jones, Ed.D., Clinical Hypnotherapist, charges $1,500 for a custom recording and $25,000 for a one-hour private hypnotherapy session at his office. But you can get all the benefits for this low price. 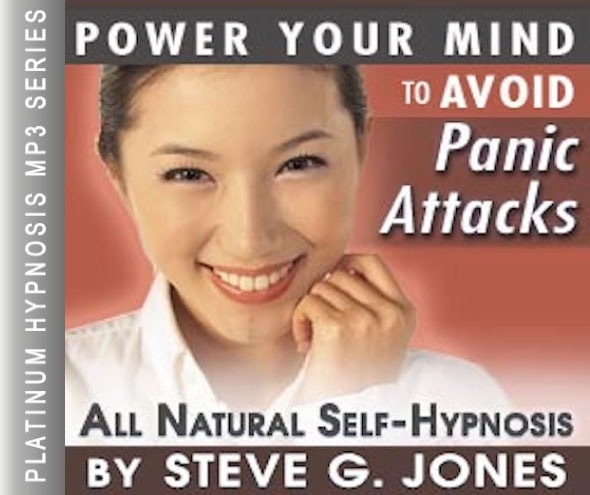 Simply listen to the Panic Attacks Hypnosis MP3 download every night as you go to bed for three weeks and feel the changes happening in your life. You will feel more empowered, more in touch with your true self, and you will truly know that your goals are within your reach. Steve G. Jones achieves AMAZING and LASTING results!!! Hypnosis is the easiest way to affect change in your life because the positive messages go straight to your subconscious mind effortlessly so you can accomplish your goals and reach for the stars!! All you have to do is listen to the Panic Attacks Hypnosis MP3 session at night as you go to sleep!!! You’ll hear soft music, the gentle sounds of the beach, and the soothing sound of Steve G. Jones’ voice all working together to bring about positive changes in your life easily and naturally. Steve G. Jones has been helping people improve their lives with hypnosis for over 17 years…now it’s time for him to help YOU… don’t wait, do it NOW !!! you’ll be glad you did. See you at the top! If you have ever had a panic attack, you know that it is a scary experience to go through. A panic attack is an episode of extreme anxiety normally lasting about ten minutes. The following are just a few symptoms of panic attacks: shortness of breath, chest pain, trembling, hot and cold flashes, sweating, lightheadedness, and dizziness. Although these symptoms are very scary, it is actually the body’s way of protecting itself under severe stress. There are many techniques that can help alleviate a panic attack. However, if you frequently have panic attacks, you should consult your doctor for a proper diagnosis. During a panic attack, it is important to try to get your breathing under control. It is best to breath in and out slowly through your mouth. It is also important to try to calm yourself down and relax as best as possible. Focusing on positive thoughts helps too. As you continue to relax, just drift now and float, relaxing more and more realizing how very relaxed you are. And you will take this relaxation with you wherever you go, because you are so very relaxed. Relaxed in your life. Relaxed from day to day. Relaxed in all situations. And any time that you need to return to a deeper level of relaxation, you simply breathe in through your nose, open your mouth and exhale slowly. And then again you breathe in through your nose. Hold it. Open your mouth slightly and exhale slowly. And these two full deep breaths relax you in any situation. And you find that day by day you are becoming more and more relaxed in every situation, that’s right. And you find that there is something in your life that you need to deal with, you deal with it quickly, easily and efficiently so that you can move on and create a flow in your life. Handling situations easily, efficiently, smoothly, creating a flow in your life. This allows you to be more and more relaxed and you are prepared for things in your life. You prepare in advance being prepared helps you relax and gives you security and confidence. And for those times when you need to relax even more you simply take a deep breath in through your nose, hold it, open your mouth slightly and exhale very slowly. And then you take another deep breath through your nose, hold it, open your mouth slightly and exhale very slowly and you relax. And day by day you are becoming more and more relaxed because you now have efficient ways to relax. You use your breathing exercise to relax. You deal with situations quickly and efficiently and you prepare for things ahead of time. Being prepared helps you feel so relaxed and at ease. Panic attacks is what results when you are experiencing an extreme case of anxiety and adrenaline floods your body. This Panic Attacks Hypnosis MP3 recording is a great tool for you to use in freeing yourself from panic attacks. Panic attacks are often caused by a sense of fear and the symptoms resulting from the attack are numerous. This powerful self-hypnosis session can help you reduce and eventually eliminate your panic attacks. The Freedom from Panic Attacks recording will relax you so that powerful suggestions will flood your subconscious mind, telling you how to deal with panic attacks before they happen and how to eliminate them once and for all. You can live a life free of panic attacks. You will feel relaxed and secure as you are listening to this Panic Attacks Hypnosis MP3 session at night for 21 nights in a row. While you are in a deep state of relaxation, the positive suggestions will help you eliminate panic attacks from your life. You are strong and you are in control of your panic attacks.